The MD9100 is a remote “All-in-One” Hot Metal Detector that combines the features of various models into one unit. The MD9100 utilizes a modular electronic controller, flexible armored optic leads and interchangeable remote lenses. The MD9100 detector provides one electronic controller that can be standardized on throughout the mill. Now there is no need to stock a detector for each different trip level. Thus costly inventory of ordinary detectors can be replaced with the single MD9100. A wide variety of remote lenses are available. Impervious to water or steam and built to withstand the harshest environments. Used in conjunction with flexible armored optic lead, these lenses provide a high level of optical accuracy by allowing the selection of the ideal lens arrangement for the installation. Robust lenses with temperature ratings of 180°C, 400°C and 1000°C can be mounted close to the hot product. Various robust lens mounts are available including air purged, air purged & air cooled, and air purged & water cooled. All remote lenses incorporate filters to minimize sensitivity to extraneous light. For general tracking, spot lenses are commonly used. Where high accuracy is required or the product deviates about the center line (i.e. 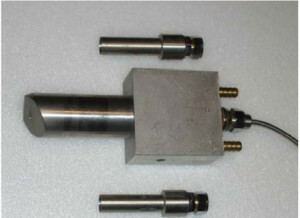 Rod Mill) a ½° x 25° precision slit rectangular lens should be utilized. This slit rectangular lens is also highly suited to Strip Mills. Also available is a high temperature Quartz Rod lens specifically for mounting in exceptionally high ambient adjacent to furnaces, hot slabs or billets. Withstands 1000°C radiant heat and provided in a robust lens shroud with protective nozzle and air purge facility. To accommodate variation in product temperature and background radiation, six specific I.R. thresholds, from 300°C to 550°C, are selectable by an internal DIP switch in 50°C steps. Further adjustment to the trip level down to 270°C and up to 750°C can be accomplished via a threshold sensitivity adjuster. 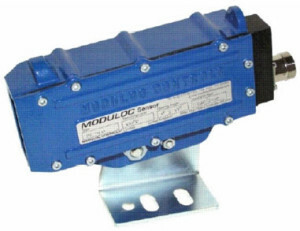 The MD9100 can be operate from either 110VAC-50/60 Hz or 24VDC power input. Standard output includes a relay with a 8A/250VAC SPNO volt free contact plus an additional switch selectable PNP & NPN transistor output. A supplementary 0-6VDC, non-linear, analog output that allows the user to align the detector to a low energy target (i.e. a flashlight) that would normally be insufficient to switch the detector. Also a remote self check feature that is remotely initiated. When activated the detector will switch and its performance checked.